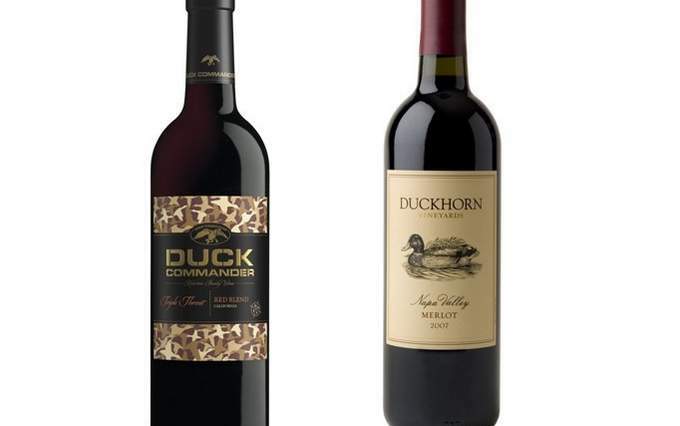 Duckhorn Wine Company has filed a trademark lawsuit against Duck Commander, Inc., Trinchero Family Estates and Wal-Mart. The suit claims Duck Commander wines violate the trademark of Duckhorn Vineyards. Duckhorn has a history of going after wineries that dare to use a duck in their names or labels. The Napa Valley winery is going after the Duck Dynasty folks because they’ve used the word “Duck” and an image of a duck on their wines. In November, the Robertson family collaborated with Trinchero Family Estates to produce three wines from California grapes: Triple Threat red blend, Wood Duck chardonnay and Miss Priss pink moscato. “We decided to create Duck Commander Robertson Family Wines because we know that many of our customers and our viewers choose to celebrate family moments with wine,” Duck Commander CEO Willie Robertson said at the time. The St. Helena winery, which produces wines that largely sell for $50 and up, has taken on a number of what it deems to be trademark violators in recent years, although not always successfully. “It turns out that Duckhorn doesn’t own the word <<duck>>,” said Jay Behmke, an intellectual property attorney at Santa Rosa law firm Carle, Mackie, Power & Ross. Duckhorn took aim at Duck Pond Cellars in Oregon in the mid ‘90s, but that case settled. Greg Fries, president of Duck Pond Cellars, confirmed the case was resolved, but said he was bound by the settlement not to comment.